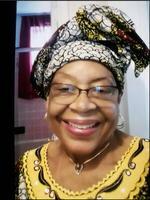 Provide comfort for the family of Bertha Ola O'Delle with a meaningful gesture of sympathy. Mrs. Bertha Ola - O'Delle was born July 7, 1941 in Beatrice, Alabama to the late Vernon and Florence Snell. She accepted Christ at an early age and was baptized at Bethel Baptist Church in Monroeville, Alabama. She attended Sunday school and served as a junior usher. Both of her parents died at an early age, Bertha and her five siblings were reared by her eldest sister Willie Mae Clausell and her husband Hestle Clausell Sr. She credits them with her early Christian Education. After graduating from high school, she move to the Bronx, New York where she met her husband, Rasheed Ola-O'Delle. They were married for over 30 years. Her husband preceded her in death on October 7, 2011. She was employed by Lenox Hospital for 38 years, where she worked as a Lab technician. She furthered her education by attending Hunter College in the Bronx, New York where she received her Associate's Degree. Her memory will live on in the hearts of her sisters Helen Hoyette of the Bronx New York, Doris Mosley of Atlanta, Georgia and Carolyn (Napoleon) Lee of Monroeville, Alabama, her sister in law Trudy Snell of San Antonio, Texas. And a host nieces, nephews, cousins and friends. To send flowers in memory of Bertha Ola O'Delle (Snell), please visit our Heartfelt Sympathies Store.